What can I make with surimi seafood? Surimi seafood is very versatile. It can be used in your favorite salad recipes, in sushi rolls or substituted for shellfish and other proteins in hot or cold dishes. Please review the Recipes tab on our website where you will find dozens of delicious menu ideas for entrees, salads, and dishes from around the world. How do I prepare surimi seafood? All Shining Ocean products are fully cooked and ready to eat for your convenience, then heat pasteurized for food safety. Since they are already fully cooked, you can eat them cold out of the bag, add them to any cold application, or they can be added to hot applications near the end of cooking to warm them up. How long will my package keep in my refrigerator? Depending on the product, surimi seafood has a shelf life from 70 days up to four months from the date of production when kept refrigerated below 38 degrees in an unopened pouch. If Shining Ocean ships the product chilled, we will stamp them with a “use by” date. If we ship them frozen and the store defrosts them before selling, the store should stamp a “use by” or “sell by” date on them. If your package has a “sell by” date, it is usually good for up to a week after that date if the package seal has been maintained. What if I don’t see a “use by” or “sell by” date on my package? Sometimes your store will forget to stamp the packages they have thawed with a “sell by” or “use by” date. In this case, you can check for the Julian calendar date/time stamp on the front of the package in the following format: YYJJJ-HHMM. The first 2 digits signify the Year (example: 2013 = YY13. JJJ refers to the day of production by the Julian calendar. Each day of the year is represented by 3 digits. For example: January 1 = 001, December 31 = 365. The HH:MM refers to the Hour & Minute the product was packed using a 24-hour clock. (00:00-23:59). I opened a package but only used part of it. How long will the unused portion still be good? We recommend it be used within three to five days, depending on how cold your refrigerator is. Once opened, it is best to keep the product in an airtight container for maximum freshness. I bought the product frozen. How long can I keep it in my freezer? Storage time will vary some from freezer to freezer. Commercial freezers (below 0C) are colder than most household freezers. For optimum product, we recommend that frozen packages be used within two to three months, but the product should be of generally good quality for up to a year. What’s the best way to thaw a frozen package? The safest way to thaw food is in the refrigerator. Small packages will thaw overnight. Larger ones may take a full day. For quick thawing, run cool water over the package in a shallow bowl until thawed, about 10-20 minutes. Never thaw by leaving a package out on the counter. If you accidentally leave a chilled or thawed package out for more than four hours, do not use. Discard it. If I’m allergic to shellfish, can I use surimi seafood instead? No. 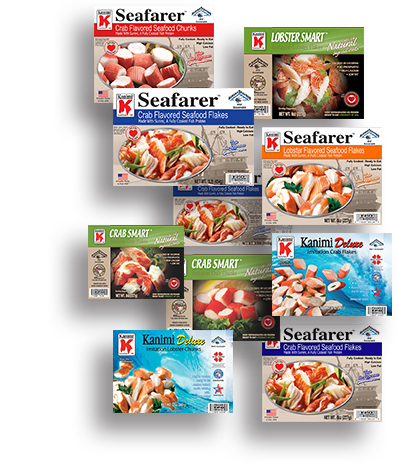 Many of our products contain real crab or lobster meat in the formula. All of them use natural extracts and flavorings, some of which could cause an allergic reaction for those with heightened allergy sensitivities. Are there other allergenic substances in your product besides shellfish? What kind of flavorings do you use in your products? We typically use a combination of naturally derived and artificial “nature identical” flavorings in an effort to capture the taste of real shellfish. For those who want no artificial flavorings in their product, we offer the Crab Smart Natural™ line with all natural ingredients for flavoring and coloring. Here are some frequently asked questions about how to use Shining Ocean products. If your question is not answered here, please click on the Contact Us tab and send us your question. A Shining Ocean representative will be happy to assist you in any way possible. © 2019 Shining Ocean, Inc. All rights reserved.